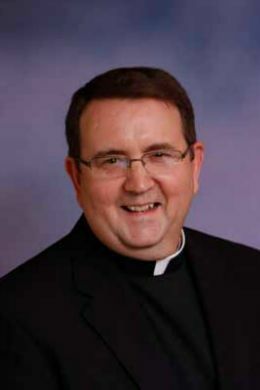 The following is the homily given at the funeral Mass of Father Thomas F. Schmitt, professor and dean of seminarians at Pope St. John XXIII National Seminary. The Liturgy of Christian Burial was held Aug. 22 at Christ the King Parish in Ludlow. Father Schmitt was 58. It was late October or early November of last year, only a couple of weeks after the initial diagnosis of esophageal cancer, that Fr. Tom became aware of how very many people were praying for him: daily prayers, novenas, people fasting for him, people here in this great parish, folks connected with Pope St. John Seminary, his large number of family members and friends, priests of the Springfield diocese and priest alumni from John XXIII Seminary, women religious such as the sisters at the Visitation Monastery in Tyringham, and then the countless others whom all these people in turn had asked to pray for him. Well, as he realized just how many folks were pounding heaven on his behalf, in his usual witty way, Fr. Tom said to me one day, “Geez, I better pull through this thing, or it’s going to be a crisis of faith for a lot of people!” He meant it humorously, but in fact for many of us, it became prophetic, because when April 15th rolled around, after all the prayers, and after the rounds of chemo, radiation, and cancer surgery, when we learned that the cancer had spread to his liver, was stage 4, and that he wouldn’t have long to live, I know for me, and I suspect for many of you here today, it was indeed a crisis of faith, or at least a source of deep disappointment, disillusionment, and anger. 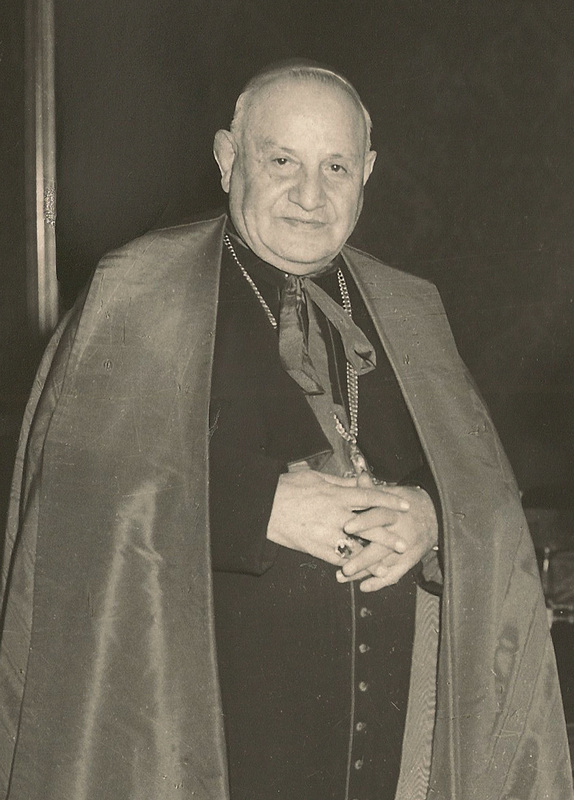 Yes, I was angry all right, angry with God, angry with all those saints whose intercession I and so many others had been praying for day in and day out, angry even at our patron Pope John XXIII about to be canonized a saint to whom so many of us had been praying novenas for Fr. Tom’s healing. In 1991 when Bishop Joseph Maguire ordained Fr. Tom to the priesthood, as part of the ordination rite the bishop placed in Fr. Tom’s hands a chalice and paten for the celebration of the Holy Eucharist and spoke these words to him, “Know what you are doing and imitate the mystery you celebrate: model your life on the mystery of the Lord’s Cross.” We speak of the Eucharist as the Holy Sacrifice of the Mass – a holy sacrifice in the sense that the Eucharist makes present for us all the One Sacrifice of Christ on the cross, enabling all of us to join the sacrifices of our own lives with that sacrifice of Christ, and in receiving Holy Communion to draw from Christ’s sacrifice that we celebrate here the grace, the spiritual power, to endure the sacrifices of our own daily lives with renewed strength and Christ-like love and charity. 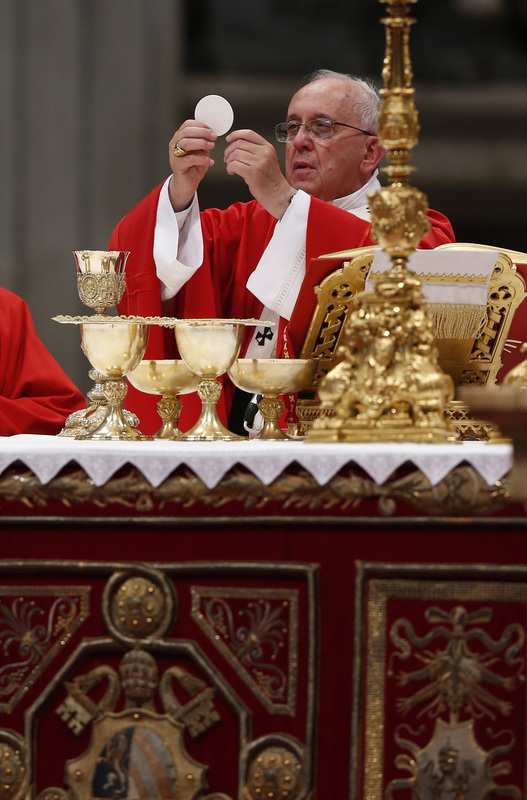 I have never known a priest more devoted to the Holy Eucharist than Fr. Tom Schmitt. He always made a point each day to spend time in the chapel praying before the Blessed Sacrament. And whenever we’d travel on vacation, he’d always have his Mass kit with him, and the first thing we’d do when we’d arrive at our destination was to find a supermarket or liquor store where we could buy some wine for the celebration of Mass each day. Early on he’d even pack a huge chasuble in his suitcase. In the course of time I was finally able to convince him that when it was just the two of us celebrating Mass in a hotel room or cabin, it was okay to forgo the chasuble and just wear an alb and stole. Fr. Tom reluctantly went along with it, but deep down was still probably questioning my orthodoxy! I believe that in his 23 plus years as a priest, other than when he was hospitalized or recuperating from surgery, he never missed a day in celebrating the Holy Sacrifice of the Mass. Even in these last weeks, he would drag himself down to the chapel in the seminary to concelebrate Mass each day. When we had Mass for him in his room the last week of his life, it was only the morning before he died when he did not concelebrate Mass. As a good teacher, even in his last days Fr. Tom continued to teach all of us how essential the Holy Eucharist is in the daily life of the priest. “Model your life on the mystery of the Lord’s cross.” An image that will remain with me for the rest of my life was when we had a prayer service for Fr. Tom in his room 3 days before he died. He held a crucifix in his hands and clutched it close to his heart throughout the prayer service, and that same crucifix was lying on his chest during his final hours and at the moment of his death. Fr. Tom selected the readings from Scripture for this funeral Mass, and while the first 2 readings are customary texts for a funeral, he specifically wanted a Gospel different from the ones in the funeral ritual book, Jesus’ words in St. John’s Gospel on love, on charity – “Love one another as I love you,” Jesus charges all of us His disciples: “No one has greater love than this – to lay down one’s life for one’s friends.” The charity, the sacrificial love of Christ that Fr. Tom celebrated in each Eucharist, he strove to emulate and exemplify in his own life. I remember on one occasion speaking to him about the polarization in the Church between so-called liberals and conservatives, and some of the other divisions that can occur among people who claim allegiance to Jesus Christ. His response was always, “Where is the charity, the love that Christ means for us to have and show?” So many of the divisions among Catholics he attributed to a lack of charity. While Fr. Tom always upheld the teaching of the Church in all matters, his approach to those who might disagree with Church teaching was patiently and clearly to try to give the reasons behind Church teaching, never insulting or demeaning the other person, but always treating the person with respect, kindness, and charity. And that is what he tried to impart to his students in the seminary these past 16 years. Sacrificial, Christ-like love was in evidence throughout his life. Who will ever forget this past March when from his hospitable bed he made it to Canaan, CT to celebrate the Mass and preach the homily at his dad’s funeral? Who will ever forget the numerous times when as dean of students he accompanied seminarians who were ill to the emergency room, or comforted them when they were in crisis or sorrow, or encouraged them to persevere in their vocation, sharing his own struggles when he had been a seminarian himself? 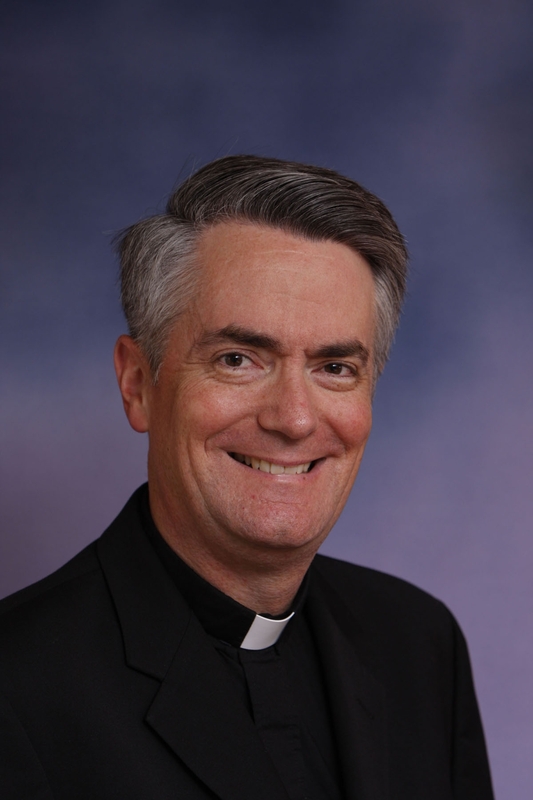 I am sure many folks in this parish can point to examples from their own experience where Fr. Tom was there for them when they were in desperate need for the healing, comforting, love of Christ, and they found it through his priestly ministry. Fr. Tom would also show his care for us when he’d remember some significant detail from our life that we’d share with him, and often when we’d least expect it – he’d bring up something we had said and with his incredible sense of timing turn it into something hilarious. I had shared with him once a somewhat callous comment made to me by someone who knew that both my parents had suffered from Alzheimer’s disease. Well, later on several occasions when I had a momentary lapse and couldn’t remember someone’s name, Fr Tom would repeat that earlier comment: “It doesn’t look good for you!” So often, his great wit, as quick and as outrageous as it often was, was a way that he expressed his attentiveness and love for us. 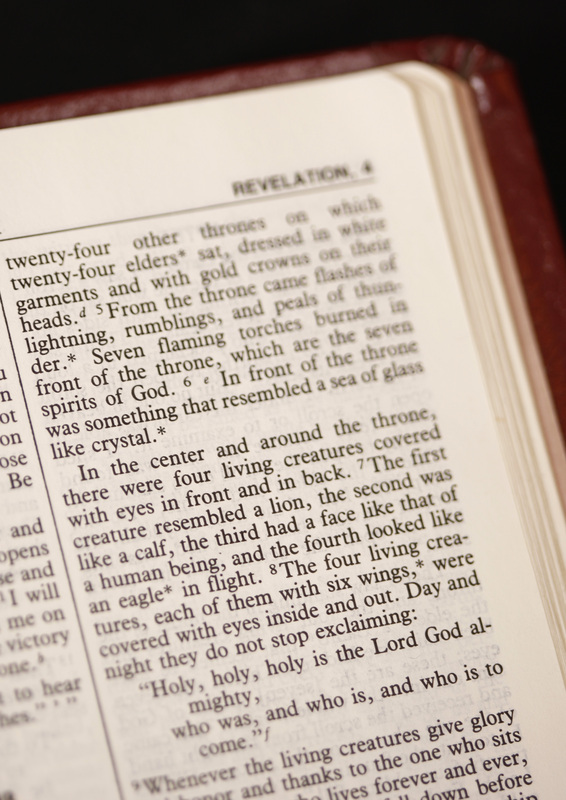 The reading from the Book of Revelation that we just heard Fr. Tom’s nephew Carl proclaim speaks of a new heaven and a new earth where there will be no more death or mourning, where we will be in God’s presence forever, and where we will share completely in the victory of Christ over sin and death. And yes, Fr. Tom looked forward to this new heaven and new earth, but did he ever love and enjoy the present heaven and earth that we all share. He could point out many of the constellations in the night sky, and when it came to the natural beauty of earth that we’d encounter on hikes and bike rides, he was so enamored and full of wonder at God’s creative artistry. He could name just about every tree, plant, or bird that we ever came across, and appreciate all the details and distinctions among their many varieties. An exceptionally bright and intelligent man, Fr. Tom excelled not only in his understanding and presentation of theology, but he also had a lot of expertise in history, science, botany, mechanics, technology, and several languages. Yet, never was he haughty or condescending; he just liked to share his knowledge and his wonder about the world around him, so that some of his own joy might spill over onto all of us. I still can’t begin to understand why God has taken such an outstanding priest, such a gifted teacher, such a wise and vivacious colleague, such a dear friend from us. But what I do know is that Fr. 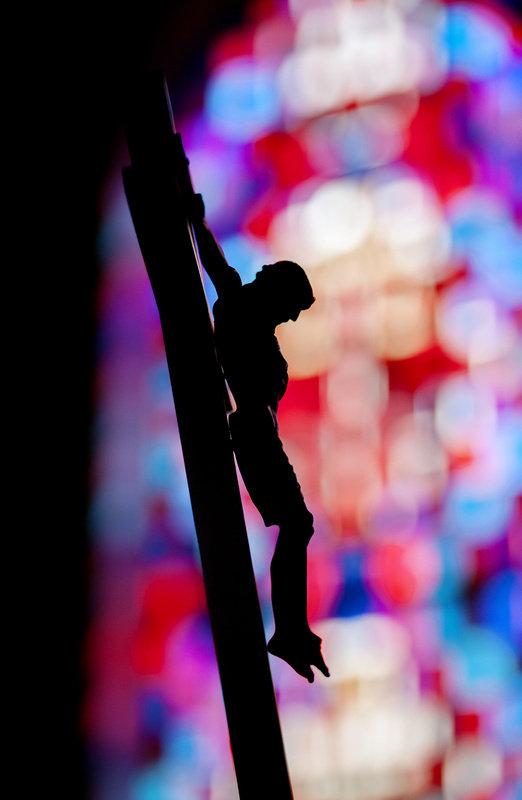 Tom did indeed model his life on the mystery of the Lord’s cross, that he exemplified what a priest is called to be, that he freely gave and graciously received the love that is rooted in Jesus Christ. As he was a witness throughout his priestly life, and especially during his illness, to the reality of Christ’s cross, so we pray that he is now sharing in the joy of Christ’s resurrection, that he is now finding the new heaven and new earth infinitely more glorious than the beautiful heaven and earth he enjoyed here with us, and we pray that Jesus Christ, whose love Fr. Tom shared so lavishly with us here, now embraces him with complete peace and joy. Today in the Church calendar we celebrate the feast of Mary as Queen of Heaven. May the Blessed Mother to whom Fr. Tom was so devoted on earth welcome him now to his place at the heavenly banquet. What a beautiful homily, reflecting on one of the most amazing priests of all time, Fr Tom truly was a heroic example of Faith Hope and Love, he will be forever missed until we meet again in the Heavenly Banquet where the angels and saints reign with God forever and ever. Eternal Rest grant unto him O’ Lord and let Perpetual light shine upon him may he rest in peace.